Important EPA Hearing Tomorrow on the San Juan Generating Station! The Environmental Protection Agency will hold a public hearing in Farmington tomorrow to determine the scope of a plan to force cleaner operation of the San Juan Generating Station in the Four Corners area. The San Juan Generating Station is known as one of the dirtiest coal-burning power plants in the nation. The massive 1,848 megawatt coal-fired power plant is owned primarily by Public Service Company of New Mexico, or PNM. 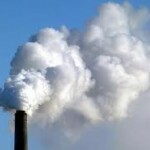 The plant, which consists of four coal-fired boilers, is located in northwestern New Mexico near the town of Waterflow. 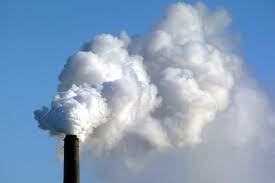 The power plant is the second largest source of air pollution in New Mexico (right behind the Four Corners power plant). Every year, its air pollution contributes to 33 premature deaths, 600 asthma attacks, 31 asthma-related emergency room visits, and other health impacts, at an estimated cost of more than $254 million. Its air pollution affects indigenous communities in the region, a number of National Parks and Monuments, and regional smog levels, the nearest being Mesa Verde National Park, which is 30 miles north. One of the best hopes for cleaning up worsening air quality in the Four Corners region is for the owners of to clean up air pollution from its smokestacks by installing proposed pollution-control upgrades. 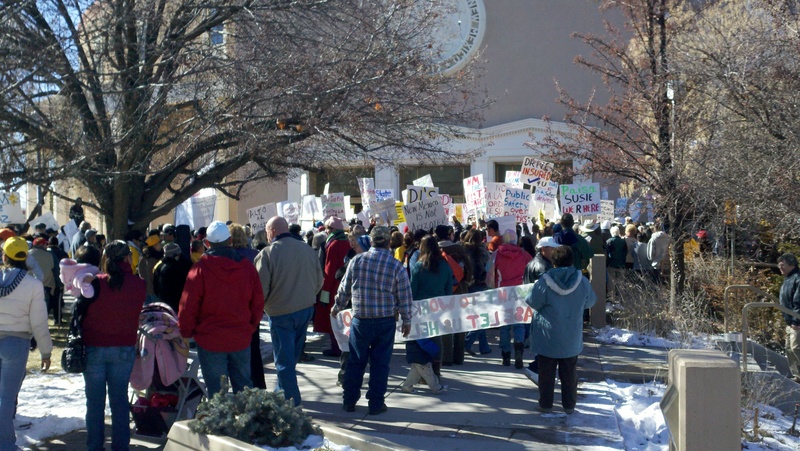 On Monday, several hundred people gathered at the State Capitol in Santa Fe to protest Gov. Susana Martinez’s recent executive order mandating that state police officers ask criminal suspects about their immigration status, and her stated intent to take drivers licenses from undocumented immigrants. 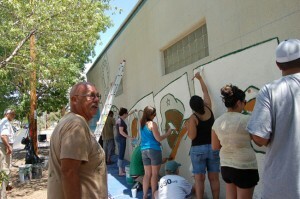 The crowd was a mixture of ages, ethnicities, and walks of life. 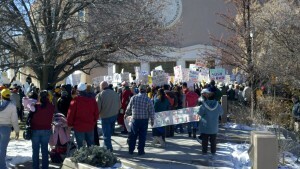 I noted a friar carrying a sign, lawmakers, activists and people with bundled-up toddlers. There were speeches and chanting and improvised noise-makers made of plastic cups filled with rocks. A lone counter-protestor holding a sign stood apart from the crowd during the entire rally. While it was balmy compared to last week, it was still a brisk day. One of the organizers approached the young woman and asked whether she would like a cup of hot chocolate or tea. The offer was declined. 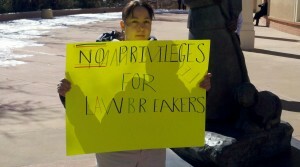 Late today (Jan. 13) came news of the second suit filed in New Mexico Supreme Court against Gov. Susana Martinez over her move to halt printing of a regulation designed to protect New Mexicans from groundwater contamination. SANTA FE, N.M. – The Citizens Coalition filed suit today in New Mexico Supreme Court against the State Governor, Susana Martinez, the Secretary of the New Mexico Environment Department, and the New Mexico State Records Administrator, in response to the move to halt printing of the adopted dairy regulation in the State Register. Papers were served on the above offices this afternoon. That’s one of my favorite lines from an otherwise forgettable movie by Spike Lee, uttered by a character played by Ruby Dee to her husband when he expresses surprise and walks out after being offended by a dinner guest he invited to his table. I thought about this line when I heard about the swift actions of new Governor Susana Martinez, who – as promised – has spent her first couple of days in office dismantling or putting on hold a number of key environmental decisions made during the Richardson administration. Those of us New Mexicans who care about the environment and who know we need to regulate corporations to keep them from befouling our state all knew this was gonna happen, but it still doesn’t ease the offense.